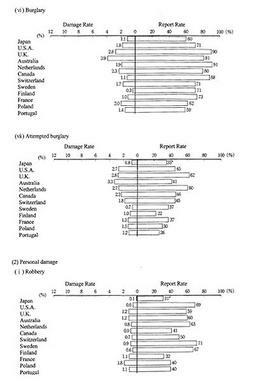 White paper on crime 2001 Part 2/Chap.6/2/3. In this section, we will make a comparison between the survey results in Japan and those of other countries that participated in 4th ICVS 2000. 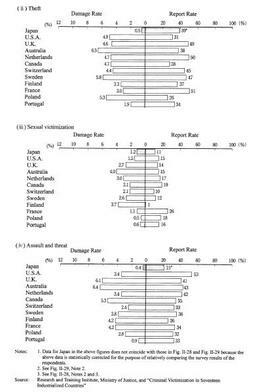 Among the 17 industrialized countries, the comparison targeted the following 11 countries that provided comparative data:U. S. A. , U. K (limited to England and Wales), Australia, Netherlands, Canada, Switzerland, Sweden, Finland, France, Poland and Portugal. Fig. 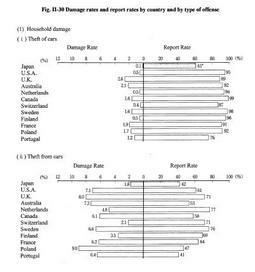 II-30 shows damage rates and report rates for"household damage"and"personal damage"in 1999 and over the last five years, by country and by type of offense. 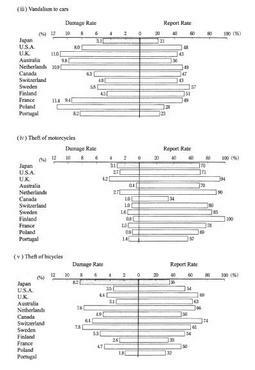 The damage rate of Japan was the highest of all target countries for theft of bicycles, the second highest following the U. K. for theft of motorcycles, and the lowest for theft of cars, theft from cars, robbery, theft and assault/threat.